Those who are trying makeup for the first time, are terrified of having an unnatural cakey look. Worry not! We understand the Indian skin and weather. Keeping in mind, that you might have to stand out in the sultry heat or you perspire loads on the face – these make up looks will keep you happy and looking glamorous. For the Indian skin it is best to either invest in a good BB cream or a tinted moisturizer. Tinted moisturizers also come in the sweat proof category so you need not worry. To apply your cream, you can either use your fingers or go in for a foundation brush. For oily skin, try the compact or powder foundation. A concealer may be required to hide blemishes or dark circles. For your eyes, go for a gel based eyeliner (which will look glossy or a normal eyeliner will do), a smudge proof kajal and (maybe if you are up for it) mascara. For beginners, we recommend playing with lip gloss and colored lip balms which will help you adjust to your new look. If you are already comfortable with lipstick, we suggest nudes for office and color for an outing. For your cheeks, a blush that compliments your skin color will do. You can improvise with your favorite lipstick which will manage to give the same effect when dabbed on with fingers. So, counting on our fingers, a minimum of 6 products can help you look your best at work or play! This, is one video we are sure you will love. It really does show how to apply simple makeup and in under minutes. Apply BB cream, starting from your cheeks, going under your eyes and then blending it in. Make sure not to use more than 3-4 drops of BB cream for a fresh look. In case you have an oily skin, blend in compact powder to put the look in place. Apply your lip balm and let it be on your lips. The lip gloss or lipstick will be applied, right at the end for the color to stay longer. Now, turn your attention to your eyebrows. In case you’d like to color in, you could use a matte brown eye shadow or eye pencil to make your eyebrows thicker. In the end, apply blush lightly on your cheek bones. Ensure that your brush strokes are light and upwards towards your temple so that it looks natural. Now with the basic makeup in place, put your lipstick/lip gloss on and your look is complete! Zuri’s Tip: Ask your product seller to give you water proof/sweat proof base for your skin type for an effective look and season. Using the above tutorial for the basic look, you can glam up the look by changing your lip color and adding a little bit of eye shadow to your makeup. In case you are not sure of what eye shadow color will suit your outfit, you should go for neutral tones such as black, gold, browns which will compliment your outfit instead of contrasting with it. The eye makeup is not as complicated as the pictures make it look to be. You can use your finger tips to blend in your eye shadow. In case you have good blemish free skin, you might want to keep your makeup really simple without foundation. We think this makeup for beginners can still be applicable to adults with great skin. We liked the hassle free party makeup look that you can incorporate for your eyes. Gold eye shadow looks great with Indian skin tone as well. Check this out. Tips in the below picture, are excellent in helping you choose your products and make your understanding of basic makeup jargon better. You might not experiment fully, as a beginner, but it certainly helps to know how makeup enhances your look. It can elongate, shorten or enhance your features the way you like. 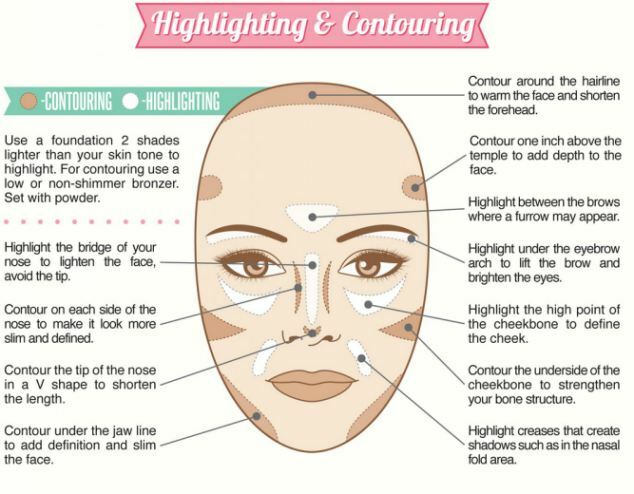 As you progress in your makeup journey, the below will act as a guide for the application of concealers, highlights and blushes. 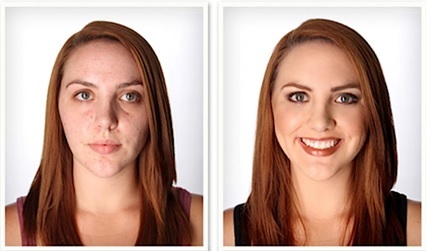 As a beginner, you might be surprised at how easy these makeup looks are to do. Once you have your basic makeup kit, you will want to look good every day. You might want to get a good tinted moisturizer to make sure that you are using the right product for your skin type. Apart from that, the rest of your kit will be reasonably priced and you will not have to think about investing heavily in makeup. Comment and let us know if you have any simple makeup tips to share!